When I was in the military service, this was my “Bible” and had read this book for a hundred times. 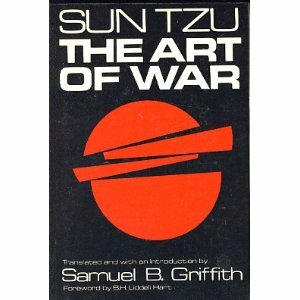 This compilation of essays written by Sun Tzu (a Chinese General & Philosopher) was translated by Samuel B Griffith in 1960 and they were written more than 2,400 years ago. It is considered as the oldest writings on the conduct of warfare. In all my military trainings, from a young officer to the generalship, the treatise in this book had been repeatedly discussed and explained to us. Being a former Commander of different units in the Philippine Army, from the squad-level (leading 9-men team) up to a Division-size Command (with almost 10,000 soldiers under me), the “treatise” of this book had been very effective in leadership; winning the “hearts & minds” of the people and at the same time in subduing the enemy. Lately, there had been books that were published in adopting the different treatise of Sun Tzu’s “The Art of War” in relation to Business and Politics but I have yet to read these books. “Know the enemy and know yourself; in a hundred battles you will never be in peril. “Know the race route and train yourself properly; in a hundred races you will always finish the race. When you are ignorant of the race route but you trained yourself properly, your chances of finishing the race or DNF are equal. On a grand scale, of which could be directed and understood by our Sports leaders and authorities in our quest for Sports Excellence and our First Olympic Gold Medal, my favorite passage of Sun Tzu’s “The Art Of War” would be very relevant and appropriate. I guess, there is no need for further explanation on this. It is no wonder that the Chinese today are on top of the Olympic Medal Standing in the latest 2008 Summer Olympic Games! Interesting! I’ve read this book before, and I know this has usually been applied in corporate settings, but never in running or non-team sports.